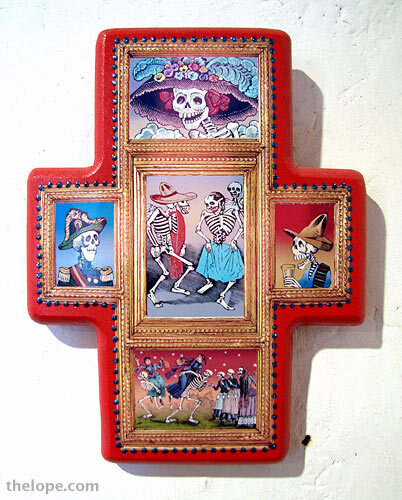 A cross on sale at the Fort Garland Museum in Colorado typifies Day of The Dead merchandise one sees in the United States. I saw this cool little set of nodding ceramic skulls at the Hutchinson, Kansas, flea market last month. I thought it funny it was sold at the classic tourist trap Santa's Workshop in North Pole, Colorado. I assume from the flowers that this is a Day of the Dead item. For lots of background information, see our first story on this beautiful and under-appreciated holiday. To see a Day of the Dead alter with candy skulls, go to 2008's Day of the Dead. For an artistic and edible appreciation of the holiday, see Cakes of the Dead. For more pictures of Day of the Dead stuff, see our posts in 2007 and 2009.